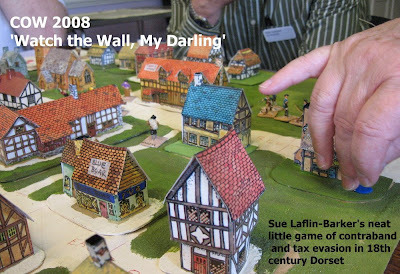 ... little games with little figures, giving a compact session's quirky entertainment, there are few wargame styles missing from the packed COW programme. ... details will be appended when I have them. Warlord Japan got varying treatments, from role play to RFCM's new figure game Battles in the Age of War (in which Bushido meets the bloodiest of barons ...). I contributed a development session on a card game inspired by the death of Cleitus ('Dinner with Alexander' ... more on this anon .. it may well make a Slingshot inclusion ...) ... and on Sunday morning, several of us put together an Ancients Mainstream review, discussing and demonstrating the current wealth of options the conventional tabletop battlegamer has to choose from (OK, with a nod to WAB and DBA, and a lot on Armati and FoG ... well it was our session and people were sensible enough to get us to focus on the stuff we know and like...). Of course, COW is much more than the strand that is directly relevant to the SoA Shows North blog. Excluding impromptu 'bandit' games, the programme was pushing 50 sessions and part of the charm is trying new things. 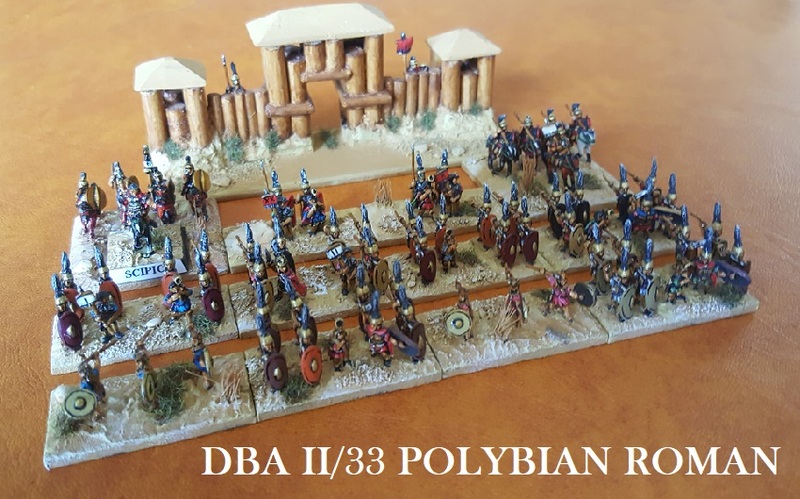 What is noticeable to the ancients enthusiast is perhaps the games less commonly played in our period: both the huge operational and 'mega'/multi-player games, and the individual and skirmish-style games (driven as much by role play and adventure gaming). 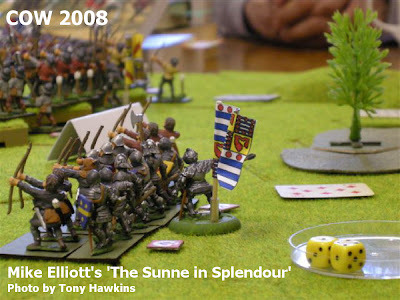 Few eras have had the tabletop battlegame refined to the level of precision and smoothness as the ancient and medieval period. 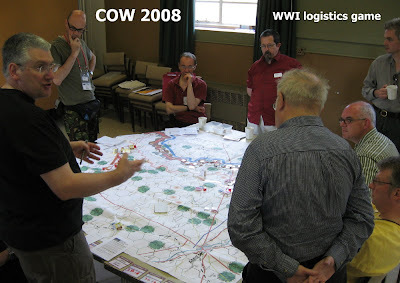 But every year, COW opens up a wider wargaming experience from which there is still much to learn and develop. Well, 'enough of all that wishy-washy stuff' I hear you telling your computers, 'what about proper toys on the tables ... ' ... OK .. 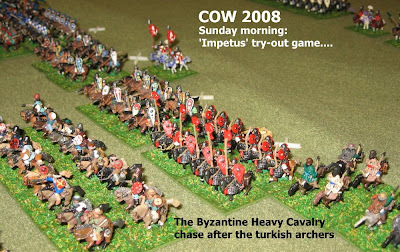 I finished my COW weekend pushing Byzantines and Turks around in a first go try-out of Impetus, helpfully put together by Fred Cartwright. I have said elsewhere that all the current 'new' games are good and work well - the writers are good at their craft, and our understanding of what the player expects from the period is well tested. The same general presumptions apply to Impetus... it clearly works ... it clearly is a thoughtful treatment of the period. 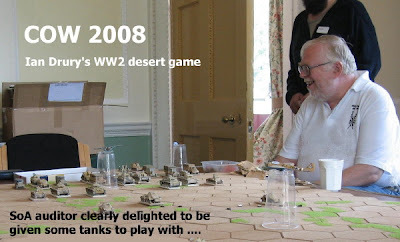 It would be unfair to say much more based just on a first outing (save that all the participants seemed to feel they wanted to see a bit more of it - which is positive) - and the fact that the simplified game is available to download (here ... ) is a bonus many will appreciate. 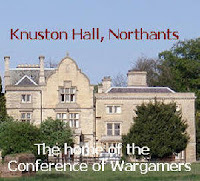 All in all, a great weekend, plenty to think about, and a wealth of interesting games and ideas. to 'shift' a few games and join up a few new members. much, everyone who had a look and were kind enough to comment. COW 2009 is now in the planning stages. If you've not been before ... maybe its a treat to consider next time round. 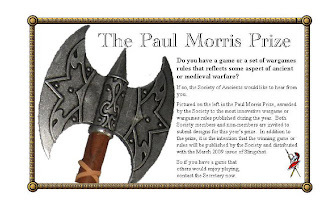 To game enthusiasts everywhere and all the WD crowd: a prompt on this theme - the Society of Ancients offers a prize for the best/most innovative new non-commercial wargame set in the ancient a medieval periods (SoA Competitions details here .... ) . We are taking submissions now. If you have a game that fits the bill (or have seen one that you think we should consider) drop the Secretary a line. If you have a game that needs a bit more development, think about booking yourself into COW next year and taking it along.